Today we want to share something with you from Peter Osborne, who is often times referred to as “The Gluten Free Warrior” because of work that's centered around helping people with painful chronic degenerative and autoimmune diseases, with a primary focus on gluten sensitivity and food allergies. Because of this work, he is one of the most sought after funtional medicine doctors in the world. Dr. Osborne wrote a book called No Grain, No Pain, which is the culmination of his years of practive and research, after seeing patient after patient struggling with everything from rheumatoid arthritis, lupus, psoriasis, migraine headaches, hypothyroid disease, to fibromyalgia. His book gives you a 30-day diet to eliminate the root cause of chronic pain. He gave us permission to post this article he wrote about gluten in makeup and skin care products. The original article was posted here. 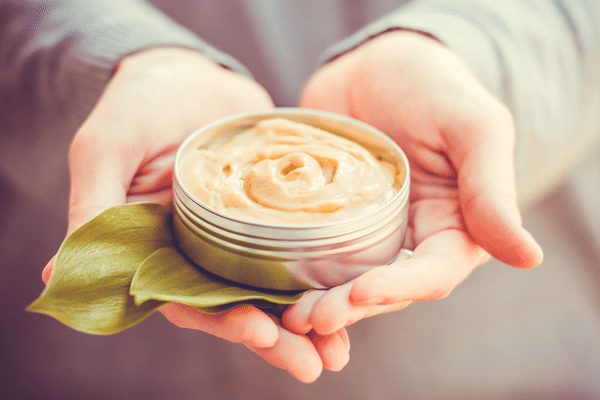 For those with gluten intolerance, sensitivity, or allergy, hidden forms of gluten in cosmetics and hygiene products can cause major health issues. After being diagnosed, most people look toward removing the toxic protein from their foods. In essence, removing obvious sources like bread, pasta, cereal, pizza, bagels, etc. For many, the diet change can seem overwhelming, and looking at hidden glutens in cosmetics or hygiene products is not even a thought yet. A recent research report published by the National Institute for Health Sciences in Japan accumulated data from 2009 to 2013 and found 1900 patients who reported allergic reaction after using a soap containing hydrolyzed wheat protein. The diagnosis for these individuals was – Wheat Dependent Exercise Induced Asthma (WDEIA). This is not the first research report on the topic. Other studies have identified asthma in hairdressers exposed to hydrolyzed wheat protein as well. Teshima R. Food allergen in cosmetics. Yakugaku Zasshi. 2014;134(1):33-8. Airaksinen L, Pallasaho P, Voutilainen R, Pesonen M. Occupational rhinitis, asthma, and contact urticaria caused by hydrolyzed wheat protein in hairdressers. Ann Allergy Asthma Immunol. 2013 Dec;111(6):577-9. doi: 10.1016/j.anai.2013.09.025. These products can contain grain and gluten based ingredients that you should be aware of so that if necessary, you can switch to a new product line. But it's not always obvious which ingredients in your products contain gluten. You can also check out our more comprehensive list of terms that contain gluten here. I have see patients have reactions because of inhaled gluten from hairsprays and from kissing a significant other wearing lipstick with gluten as an ingredient. If you are looking for a substitute skin moisturizer, try coconut oil or jojoba oil. If you are looking for cosmetics without hidden gluten, listen to this interview first. Remember, that no matter what product you are using, the manufacturer retains the right to change the ingredients without informing you, so the most important walk away is simply this – READ THE LABELS before you buy! I am allergic to fragrance and have pretty sever fructose malabsorption! Thank you for this list! !